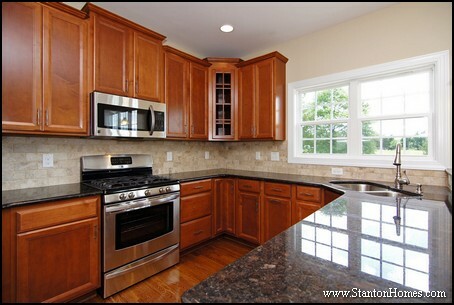 Glass front cabinets often look best when used pairs, or across multiple spaces (such as adding glass doors to complement another glass design in the same room). 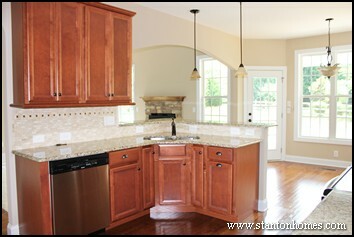 Arched glass front doors mirror the recessed cabinet door design in this French country kitchen. 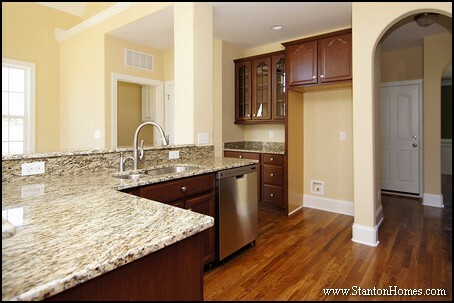 Glass kitchen cabinets can be used to draw attention to a specialty space - such as this butler's pantry designed as a show-case areas - which is set into the kitchen, around the corner from the formal dining room. 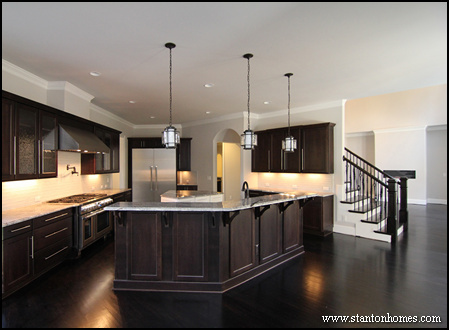 The kitchen cabinet doors match the Provincial interior door design, which has four vertical panels with a cathedral arch on top. 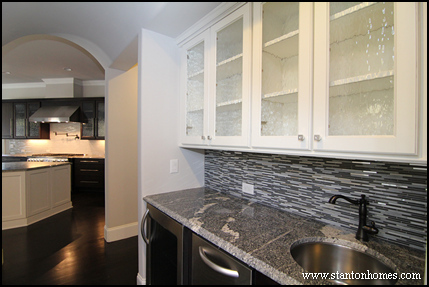 Butler pantries - whether located in the kitchen, formal dining room, or somewhere in between - are a popular place to add glass cabinet doors. Butler's pantries were originally designed for easier access to glassware and silver as a surface for setting out appetizers, drinks, and desserts. 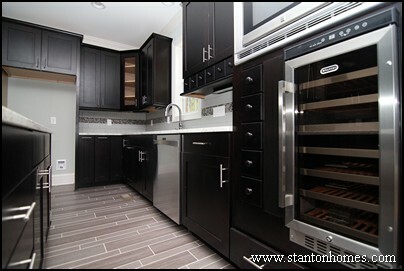 New home butler's pantries are now often packed with even more purpose, used as meal preparation and clean up centers, often with the aid of features such as a built-in sink and wine or beverage refrigerator in addition to showcase cabinet storage. 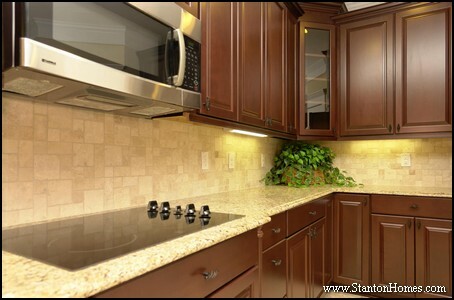 Fluted or reeded glass cabinet doors will create a clean, modern look in your kitchen. Fluted glass designs can act as a formal display case: they will slightly obscure cabinet contents, without completely masking what's inside. 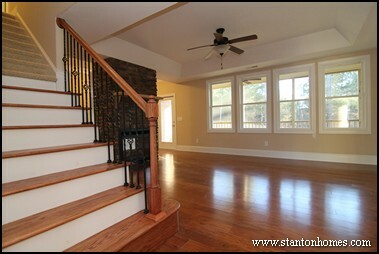 In this Raleigh custom home, fluted glass front cabinets make an appearance above the living room bar and on along one kitchen wall. 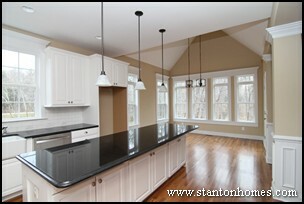 The kitchen pendant lights echo the cabinets, with a fluted glass casing. 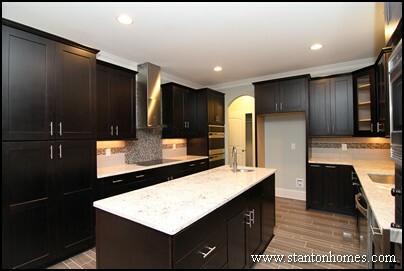 Dark kitchen cabinets lend formality to the space, especially when paired with glass-front corner cabinets. 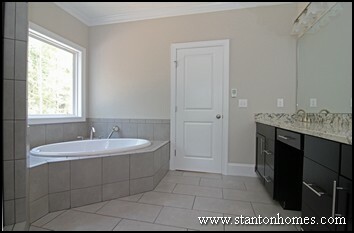 This glass cabinet door is placed to show off the homeowner's formal china set. 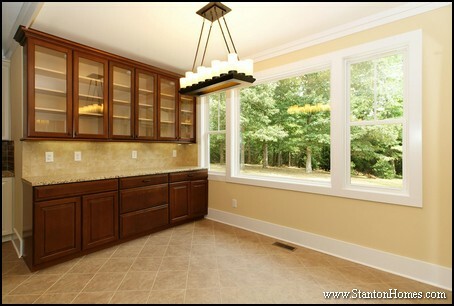 In this Raleigh custom home, the glass door grids make the space a bit more casual, to echo this easy-living peninsula kitchen design. 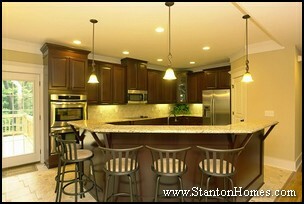 Brown and black tones pop up throughout this kitchen - from the cabinets to the granite counter tops. 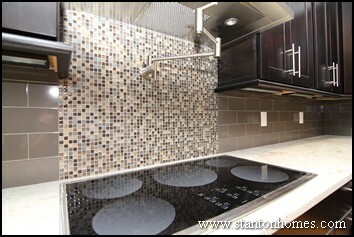 Adding glass fronts to a corner cabinet can really lighten up a dark kitchen. 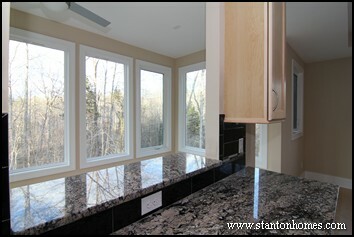 Clear glass on the cabinets call out to the glass front wine refrigerator in this Raleigh custom kitchen. 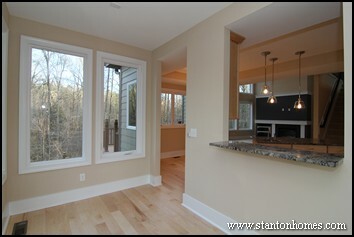 Glass doors are also popular additions to your kitchen pantry - such as the one in this contemporary Raleigh kitchen. 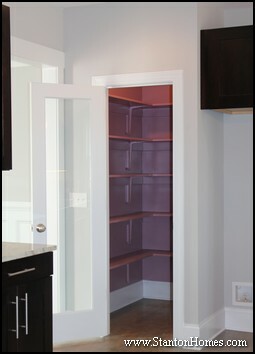 A full-height clear glass pantry door shows off this light purple painted pantry. 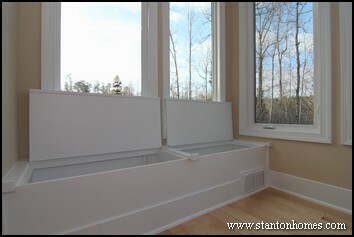 If you're looking for a bit more concealment, a frosted glass pantry door will do a better job hiding clutter. 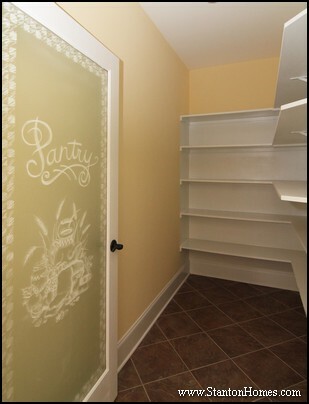 This Raleigh custom home pantry door announces it's presence with the word "Pantry" etched in. 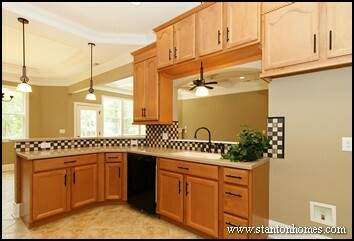 The kitchen is the heart of your home, and one of the top reasons for building a Raleigh custom home. 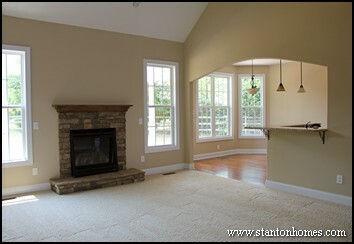 Click here to contact Raleigh custom home builder Stanton Homes or call 919-278-8070 to talk about the new home you want to design and build. 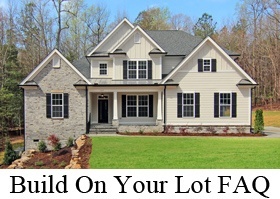 The most popular floor plans for North Carolina new home buyers are designed with ample kitchen storage - without sacrificing open square footage. 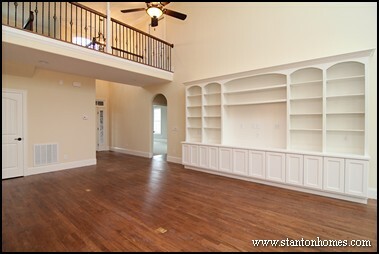 One of the best ways to offer lots of shelf room is with a "Costco" style pantry. What is a "Costco pantry"? Costco shouldn't really get all the credit. BJs, Sams Club or anywhere you go to stock up gives you the same result - buying in bulk is a great way to save money as long as you have somewhere to store it. 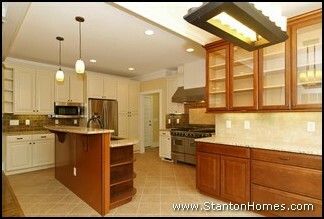 That's why savvy home buyers look for ways to design a kitchen that can store their bulk buys. 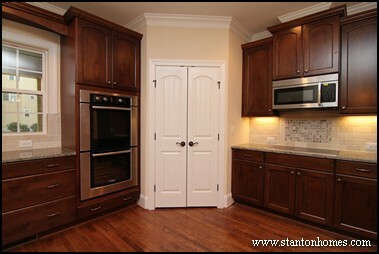 If you like to stock up, an oversized pantry is an important aspect you'll want built into your new kitchen. 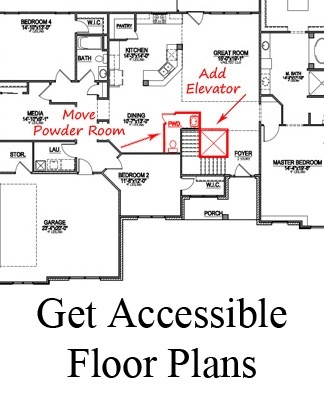 Ask your builder what will work best with your plan: Many new home kitchen floor plans integrate a walk-in pantry in a corner of the kitchen, or just around the corner in a hallway or nook. 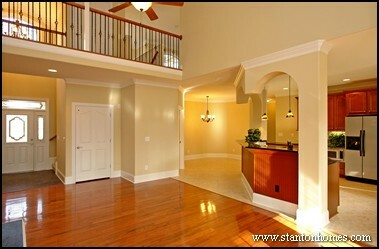 Here are the top 7 best kitchen floor plans with a Costco size pantry - for Raleigh North Carolina new homes. 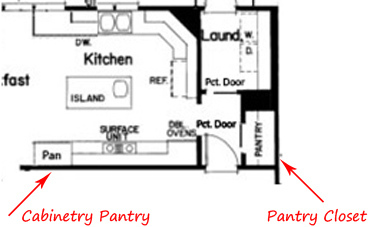 Best kitchen floor plans pantry style #1: A Costco style pantry is a large, walk-in pantry - designed for ample storage and convenience. 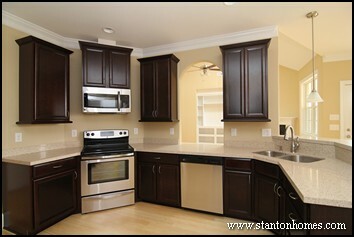 When pantry size matters more than location, Costco pantries can be located anywhere that's convenient to the kitchen. 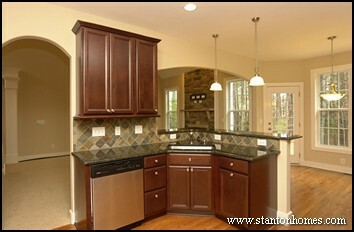 Get this pantry style: A good example of a non-corner, walk-in style pantry is in this version of the Carwile - which includes a 5x10 pantry - supplemented by island cabinets and a nearby mudroom. 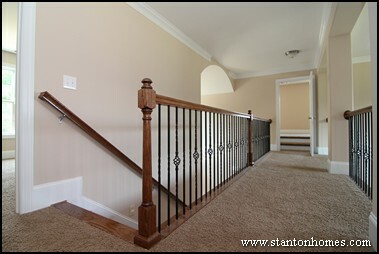 To avoid using the main pantry as a "catch all" for kitchen-related storage (such as mops, brooms, and tall cleaning supplies), a separate mudroom / laundry room was included just around the corner. 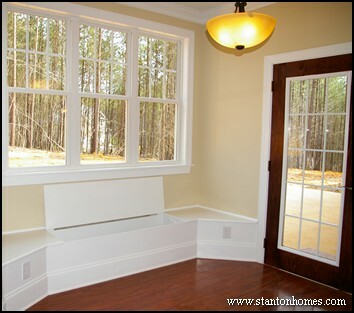 This "home hub" design is perfect for keeping storage areas distinct and uncluttered. 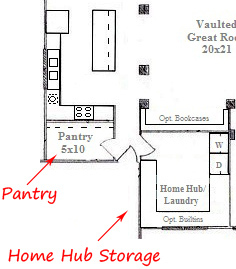 Best kitchen floor plans pantry style #2: A cabinetry pantry integrated into the kitchen can supplement a walk-in pantry placed around the corner. 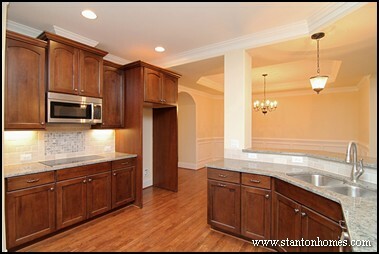 Having two pantries can improve organization and add to kitchen storage without disrupting an open floor plan design. Get this pantry style: When deciding between kitchen cabinets and drawers and a cabinetry style pantry, think about what type of storage you need most. 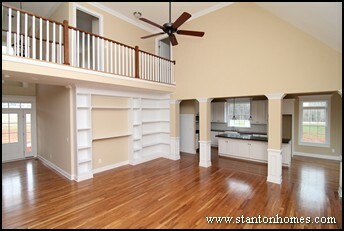 If you often buy in bulk, consider a second pantry over "standard" kitchen storage units. 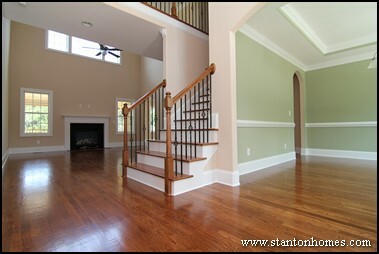 Click here to see photos of another home with two pantries - one closet style pantry and one cabinetry pantry. 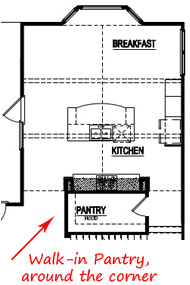 Best kitchen floor plans pantry style #3: An L-shaped walk-in pantry can maximize shelving without reducing the look, feel, and maneuverability of the kitchen. 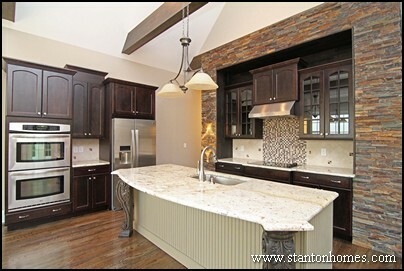 Get this pantry style: When choosing the best kitchen floor plans, keep in mind how close your pantry needs to be to the cooktop and refrigerator. 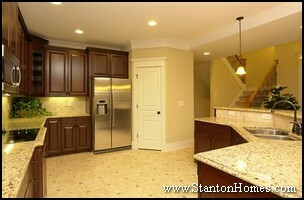 The further from the kitchen you go, the more long-term the storage should be. 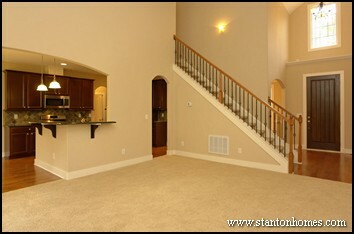 Consider reserving a few cabinets for daily-use items, if you want to keep the Costco pantry out of central walkways. 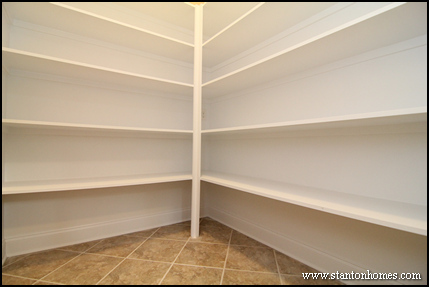 Best kitchen floor plans pantry style #4: Expanding a pantry by adding another wall of shelving can add a lot of functionality to your kitchen. 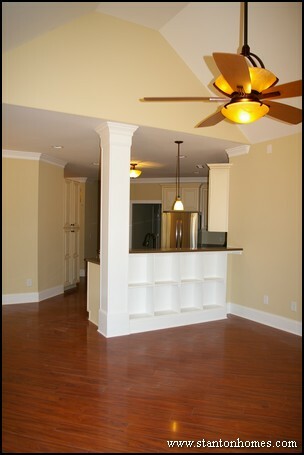 Even if a plan doesn't come with a pantry that's big enough for everything you want to store, top builders can find a way to fit it in. 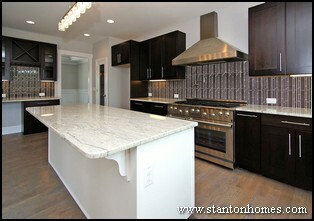 Ask us what we can modify in the kitchen floor plan to add storage and efficiency. 1. 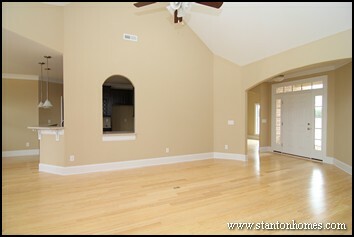 Moving the door to the garage to kitchen, where there was more space to accommodate it. 2. 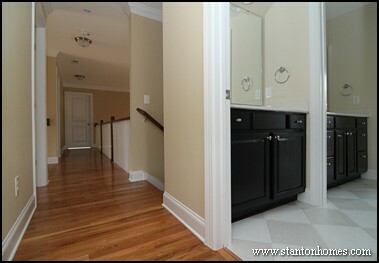 Removing the pantry's double doors and adding a single door between the kitchen and pantry / laundry room. 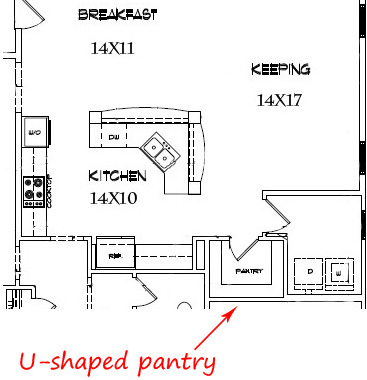 Best kitchen floor plans pantry style #5: A U shaped pantry is great for "at a glance" storage. 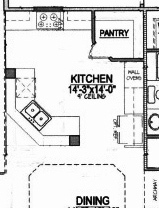 U shaped pantries, which are actually more in the shape of a square, require more depth (and less width) than an L shaped pantry - so your selection may depend on the overall kitchen floor plan. 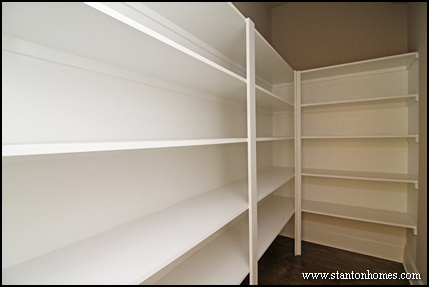 A U shaped pantry does not always hold more goods than an L shaped pantry - it depends on the overall square footage and shelving design. Get this pantry style: Many of the best kitchen floor plans place pantry and laundry room storage near each other - which creates distinct areas for food, paper goods, soaps, and supplies while containing daily necessities in a common area. 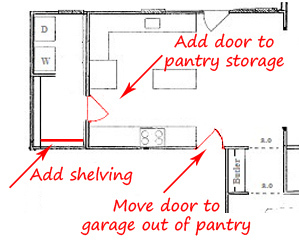 Best kitchen floor plans pantry style #6: Angling a pantry can add more storage space. 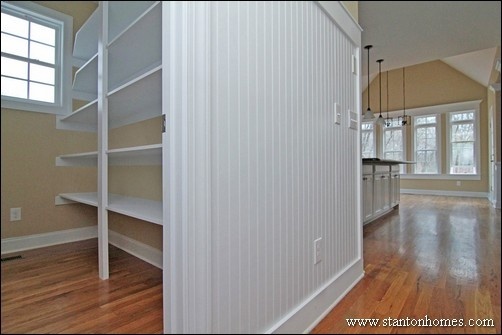 Get this pantry style: Ask your builder if placing your pantry at the end of a wall, as opposed to the center of the room, can allow you to angle shelving for more storage. 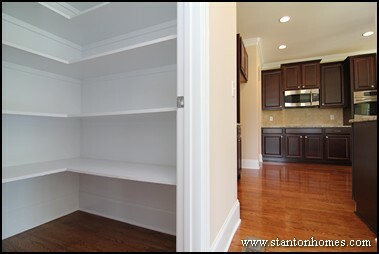 An angled pantry can also add more visibility to the storage area. 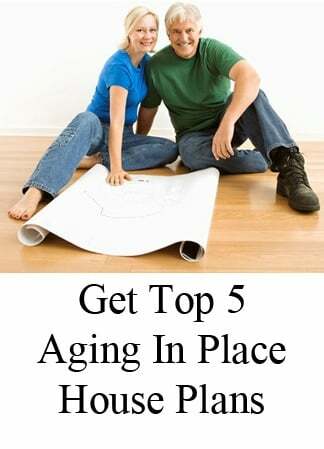 Best kitchen floor plans pantry style #7: A classic design remains one of the best kitchen floor plans with a Costco size pantry: a tucked-in corner pantry. 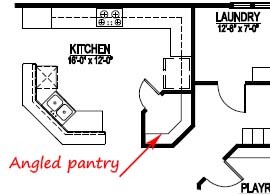 A corner pantry generally takes the shape of a square, rather than an "L."
A corner pantry is located centrally in the kitchen (rather than tucked to one side). Get this pantry style: Consider adding French doors to your pantry - doors that swing outwards can make it much easier to see everything in the pantry at a glance. 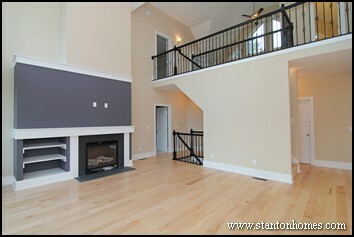 Unexpected new home floor plan trends | Are homes getting smaller? 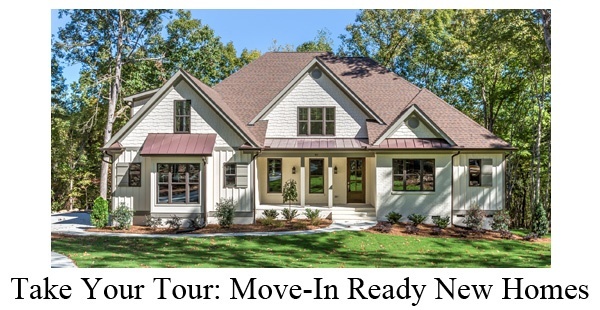 New home floor plans are trending down in size, with more than one-third of homeowners reporting a preference for homes under 2,000 sq ft.
Why are we seeing a decline in home size, after a 40% growth trend over the past few decades? 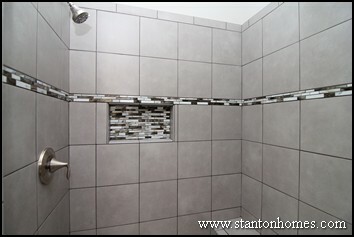 New home trend data is courtesy of Alan Mascord Design Associates Inc. 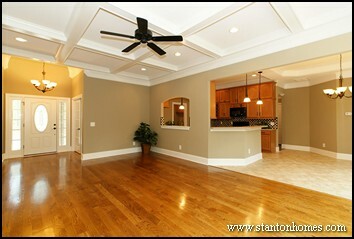 In the infographic below, Alan Mascord predicts US homes will look like in 2015. 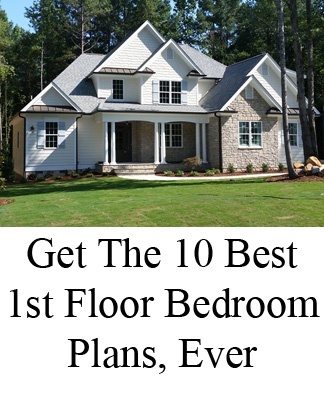 Single Story Floor Plans 1500 to 2000 Square Feet: There are hundreds of one story plans to choose from, and our in-house design work comes at no extra cost. 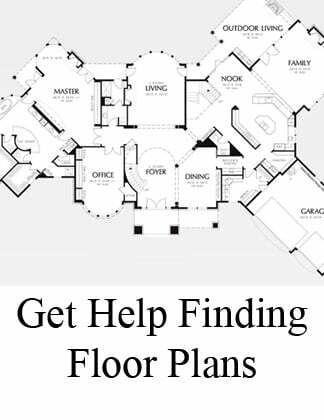 Main Floor Master Plans 2000-2500 Square Feet: Main floor master suites are one of our most popular options – and we spend a lot of time refining designs to make a great plan perfect for you. 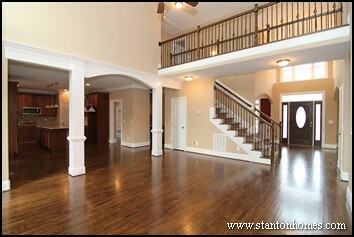 Two Story Homes 2000-2500 Square Feet: You’ll get the most value in your square foot cost when you build up, in comparison to a sprawling one story with the same amount of space. 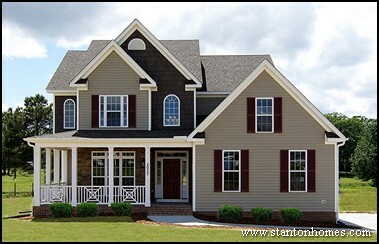 Stanton Homes builds extraordinary custom homes with personal service you won’t find with any other builder in our price range – and a Price Match Guarantee.